A week ago, we had a few days of pleasant 30-degree weather here in Minnesota, perfect weather for winter sowing native plants for the meadow I maintain behind my house. The meadow has been challenging, to say the least. There is a lot of weed pressure near it (and in it). It’s been one of those garden projects that reminds you just how small and ineffective you are compared to Nature, with a capital N.
So, I was thrilled to see that Prairie Moon Nursery, where I bought most of the plants and seeds I’ve used in the meadow, was offering a Jungle Prairie Mix of seeds. According to Prairie Moon, the Jungle Mix “includes the most robust and competitive prairie plants available. The Jungle Prairie is perfect for a weedy ditch, a privacy screen, or for just establishing a profusion of flowers while providing habitat for wildlife.” Sounds good to me. The directions for spreading the seeds call for dividing your area into smaller spaces so that the seeds are more evenly spread. I visually divided the meadow in four, then mixed one-quarter of the seeds with a filler material and spread it on each section by tossing it as evenly as I could. My husband raised the issue that birds would eat the seed, but we did not see any increase in bird activity after casting the seeds. We have a feeder not too far from the meadow, so hopefully they will get their sustenance there. 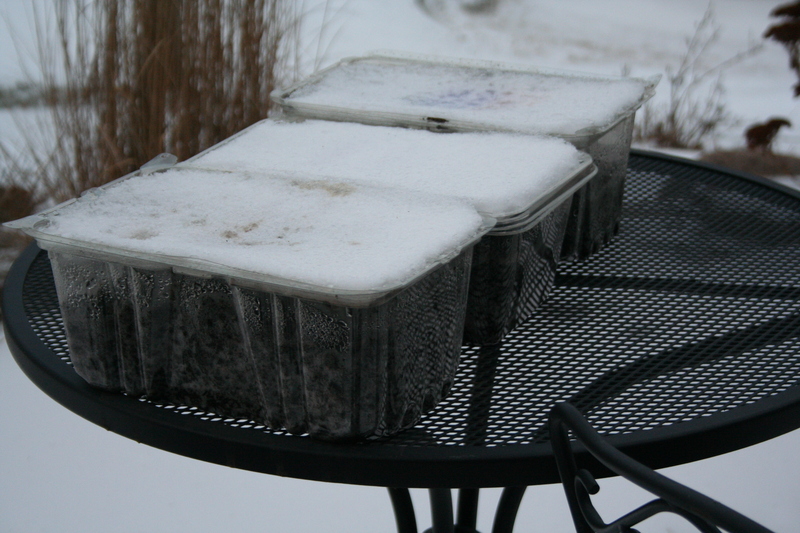 Anyway, I have complete instructions on winter sowing in containers on the blog and followed them, using a fairly light potting mix, which included potting soil, perlite and vermiculite. Three of the winter sowing boxes are outside now and more will be added as we empty lettuce containers and milk jugs here. Will you be winter sowing this year? My grandmother used to scatter endive seed on top of a snow bank. Another spot was where she had a bed of larkspur. Cool idea! There are plenty of snow banks in Minnesota now, too.